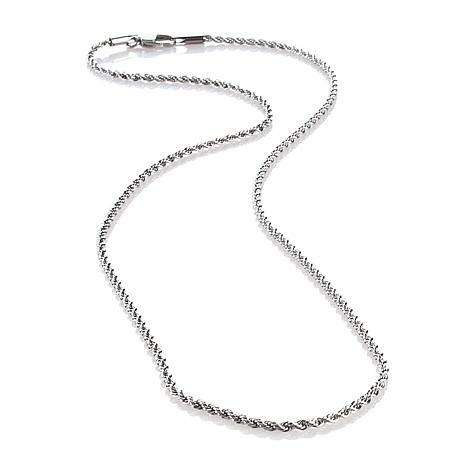 Delicate-looking yet sturdy enough for favorite pendants, this stainless steel rope chain won't spend much time in your jewelry box. It has the sophisticated look of sterling silver at a fraction of the cost. So why not treat yourself today? It's a secret worth sharing! 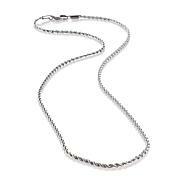 I am very impressed with this chain and will use it often. I would like to request this chain in a 26 and 28". Nothing pulls my hair out which is wonderful!! I am glad to find a necklace that is silver colored , but not made of silver. It is good weight and pendants look very nice on it. I bought this to try with a pendant and it is a great chain, but its a little too masculine for me. 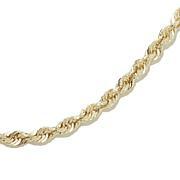 But very well made, good quality, durable chain. This man knows how to make a good chain. Thats for sure. Really nice sturdy chain. Length is just right. I wonder if there's a slight trace of nickel in it though, which I'm very allergic to. When I swear I notice some itching a d irritation.